This is the first post in a series of three. Parts two and three will be published on subsequent days. 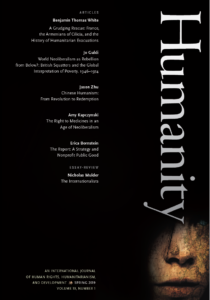 In his book Empire of Humanity, Michael Barnett outlines some of the strengths and contradictions of humanitarianism using the notion of “empires.” First, he applies this notion to the definition of humanitarianism: “What distinguishes humanitarianism from previous acts of compassion is that it is organized and part of governance, connects the immanent to the transcendent, and is directed at those in other lands.” The question of power in humanitarianism comes up again in the conclusion of the book: “Empires are branded as illegitimate because of their authoritarian qualities, but humanitarian governance is hardly a paragon of democratic rule.” The spaces of an empire of humanity extend beyond borders of states, classes or cultures. Secondly, Barnett also links the notion of an empire to passing time: forces of destruction, production, and compassion “shaped the overall purpose of humanitarianism and constrained how humanitarian organizations confronted the ethical dilemmas of the day.” Barnett distinguishes the ages of Imperial Humanitarianism (1800-1945), Neo-Humanitarianism (1945-1989), and Liberal Humanitarianism (1989-present). All this suggests that empires are structured in both space and time. But it also lacks clarity. It could become clearer when we look at some mechanisms which enable humanitarians to become credible, taking into account further forces that structure humanitarian spaces and action. My aim in the following lines is to suggest three models that may help to clarify the difficult relationship between power and aid. Each represents a distinct attempt to shed light on histories of humanitarianism. Drawing on theories due to Marcel Mauss, Michel Foucault and Giorgio Agamben, I suggest that the paradigms of exchanging gifts, structuring knowledge, and taking oaths can each help us understand the development of power relations in the terrain of humanitarianism. Each concept is illustrated with examples from the interwar years involving the International Committee of the Red Cross (ICRC). I will thus endeavour to show how these models of power in spaces describe some western forms of European humanitarianism during the interwar years. It is left open whether or not these concepts apply more generally to other places and times in the history of humanitarian action. But I think they grasp some social, technical, and political conditions for humanitarianism that may well exist elsewhere in specific times. Exchanging gifts: The French sociologist Marcel Mauss developed a theory of society by looking at the exchange of gifts. A well-known quotation from his famous “Essai sur le don” (1923/24) underlines that there is always more to exchanging gifts than can be explained by theories of utility maximization. “La charité est encore blessante pour celui qui l’accepte, et tout l’effort de notre morale tend à supprimer le patronage inconscient et injurieux du riche ‘aumônier’.” The gift and the donor are inextricably linked, the gift has a meaning that goes beyond the given object itself, and giving gifts creates bonds. Once the gift has been accepted, there is a certain pressure to reciprocate. The most common way to do so is to show gratitude. In German there is a mixed expression for giving a gift and helping another person (Hilfe schenken) that underlines that any kind of assistance can be seen as the act of giving someone the gift of help. If we apply the paradigm of the gift to a history of humanitarianism, the focus automatically shifts away from the well-known narration of the humanitarian actors and their deeds to a narration of social ties between the donor and the receiver of help. Taking Maussian concepts as a starting point, stresses the asymmetry of the relationship between these actors. From this point of view it is interesting to analyze the expressions of gratefulness and the awarding of honors. The institutionalization of gratitude (offering medals, honorary titles, celebrating past aid actions, etc.) accompanies the institutionalization of aid itself. It is a part in the process of reciprocating gifts. A Maussian act of gift exchange? 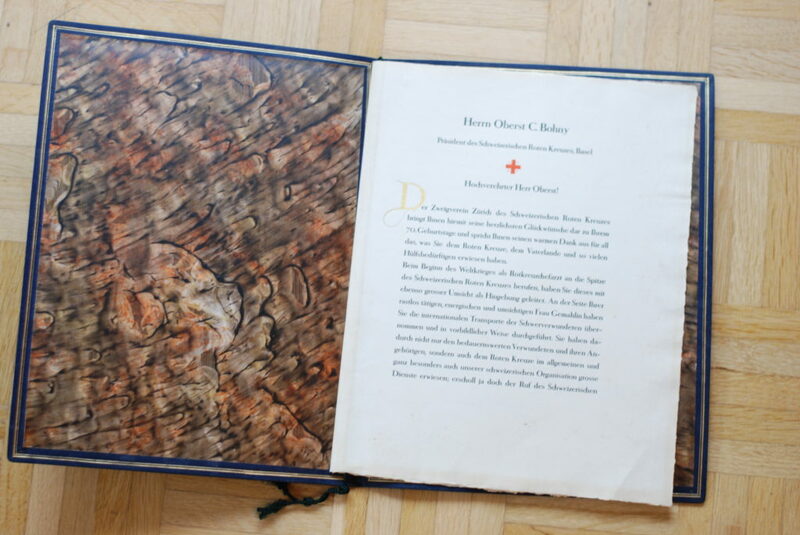 The Zurich section of the Red Cross expresses its warmest wishes on the 70th birthday of Swiss Red Cross president Dr. Karl Bohny in 1926. Geneva as a center of humanitarian action is a “gift for Switzerland”, said Swiss Foreign Secretary Didier Burkhalter in 2014. 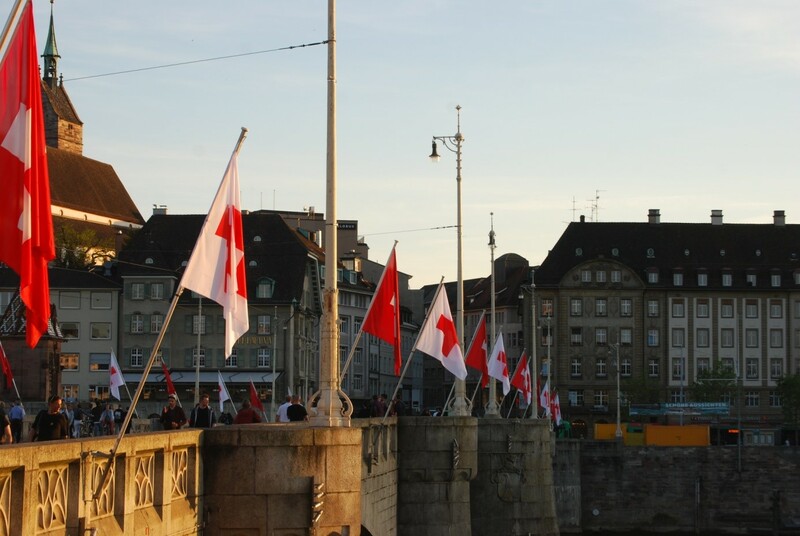 Ties between the institutions of the ICRC and Switzerland are shown as on 8th May 2016. The day is the World Red Cross and Red Crescent Day and it honors the Henry Dunant, who was born this day in 1828. Both images courtesy of and copyright Thomas Brückner. In addition to leading the development of an international humanitarian convention for prisoners of war, accepted in 1929, the ICRC also drafted many other proposals for the protection of civilians or the establishment of protected places (so-called lieux de Genève) that were never signed by governments. The ICRC helped not only others by drafting conventions. It is interesting to note that the first statutes of the institution date from 1915, and were revised shortly after WWI. Most importantly, in the interwar period the institution entered an era of competition with the newly founded League of the Red Cross Societies. At some points the whole Red Cross movement was threatened by this antagonism, and it was by means of legal dispositions that a solution was sought. It comes as little surprise that in this climate, the ICRC—in need of money, reputation, and expertise—was in search of “legal gifts.” It was Max Huber, professor of law from Zurich, diplomat, and President of the Permanent Court of Legal Justice who showed himself willing to provide them. He was the most prominent of a number of legal experts who entered the Committee as a volunteer in this period, and his gift of expertise, resources, and wisdom was so great that the ICRC even broke a long-standing rule of admitting only members from Geneva. It was Max Huber who resolved the conflict with the League in 1928, and he became president of the ICRC in the same year. He also wrote many books on the Red Cross principles. In the 1920s and 1930s the ICRC opened and broadened to include members from different segments of Swiss society (women, Catholics, Swiss Italians, Swiss Germans). By taking on gifts, the institution changed itself, and here the asymmetry and dependency created by a gift is made visible: Huber’s personality brought many “new cultural values” to the institution that its Geneva-only members likely would not have taken on if the institution had not been looking for help in the early interwar years. Looking at the development of humanitarian institutions rather in terms of social ties that change by giving gifts and reciprocating them offers the possibility for new explanations, how power develops in humanitarian action. Furthermore, the concept of giving gifts equally allows us to look at the humanitarian as the needy, as outlined above: Humanitarians in need of money, ressources, and dependent on recognition. Michael Barnett, Empire of Humanity. 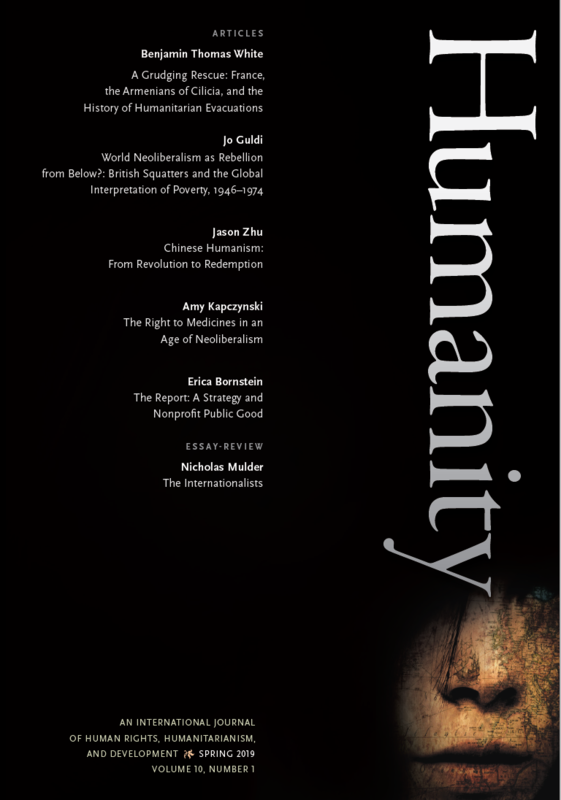 A History of Humanitarianism (New York: Cornell University Press, 2011), 21. This corresponds to the period examined in my doctoral dissertation, “Hilfe schenken. Die Beziehung zwischen dem IKRK und der Schweiz 1919-1939” (Zürich: NZZ Libro, 2016). Marcel Mauss, Essai sur le don. Forme et raison de l’échange dans les sociétés archaïques. Présentation de Florence Weber (Paris: Presses universitaires de France, 2012), 214. Bruno Cabane, The Great War And the Origins of Humanitarianism 1918-1924 (Cambridge: Cambridge University Press, 2014), S.300. Thomas Brückner studied at Free University Berlin, London School of Economics, École des Hautes Études en Sciences Sociales History, Political Science and Sociology. He completed his doctoral dissertation on the relation between the ICRC and Switzerland in 2015 at University of Zurich. His book Hilfe schenken. Die Beziehung zwischen dem IKRK und der Schweiz 1919-1939 is about to appear (NZZ Libro). In 2013, he co-edited Die Basler und das Rote Kreuz - 125 SRK Basel. He works as head of communication for Swiss Civilian Service.